For infants and young children, the hammock and the pillows can be arranged into different positions, according to what is required. You can make a flat platform for small children to sleep and play on, just like their bed at home. They have more room to spread out and play and it will also help to stop their toys falling onto the floor and getting lost. Older children can use the hammock to support their feet and legs. The inflatable pillows can be moved around to make different positions achievable. They may like to vary the height and position of the pillows, by adding or removing and changing the inflation levels of the pillows. Making them soft and squishy or hard and firm – Experiment! It’s a tool to help your child sleep and play more comfortably on long haul flights. 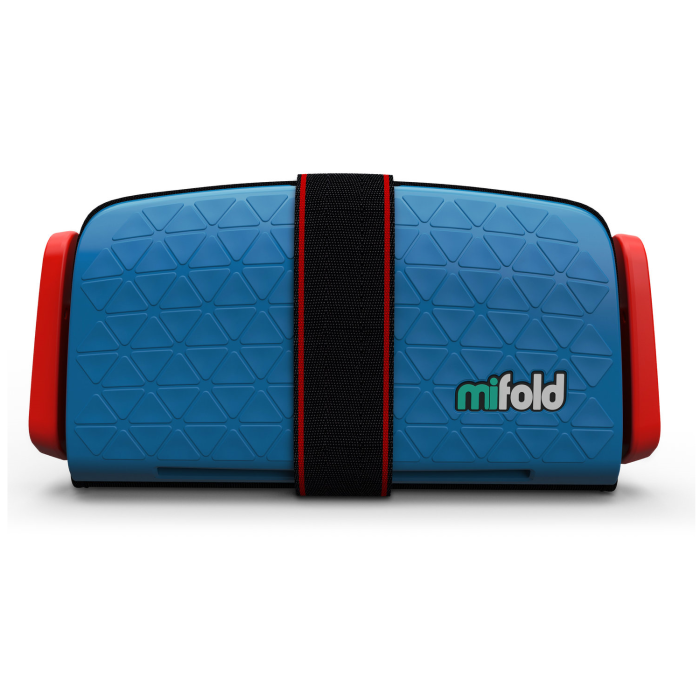 Washable, folds compact, and weighs less than 500g! Its versatile design accommodates for the differences in kids and airline seats. 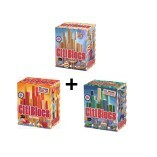 SKU: FLYFLEGSUP-Kids. Category: travel gear. The hammock is a comfort aid, designed to support your child’s legs and feet for sleep and play when they fly. Move the pillows into different positions, sideways, sloping, stacked etc. 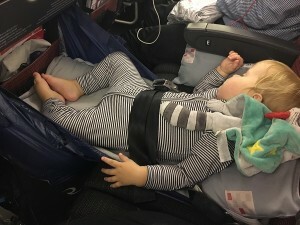 If your child is small enough to lie completely flat, it’s a good idea to bring their favourite small pillow from home to lie their head on (or use the supplied airline pillow), as some airline seats slope slightly down towards the back of the chair and this will level it out, for a more comfortable and cosy sleep. For older children who do not need a flat platform, you can use one of the Large pillows (inflated 1/2 or less), as a head or armrest. 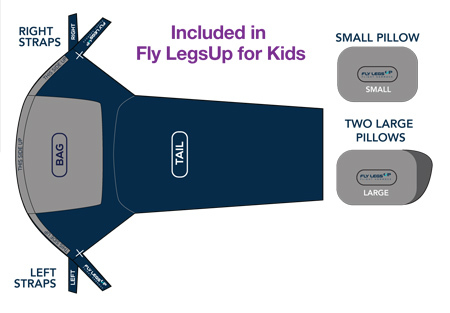 Or if you don’t think this is necessary, you can purchase a Fly LegsUp for Adults – which comes with 2 pillows. 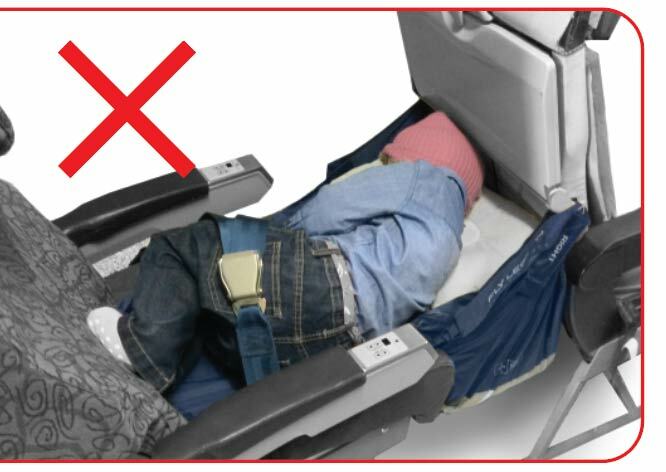 DO NOT use the hammock with the child’s head under the tray table (head pointing towards the front of the plane) as in some airlines, when the chair in front is suddenly reclined, it may come back further than expected and contact the child’s head. Also the seatbelt which we recommend you use in case of sudden turbulance, may not be as secure in this position. Note: Children should be supervised by an adult and wear a seat belt at all times. The cushions add to the comfort and support, creating the platform just like a bed! (no pump required). The cushions can be repositioned in multiple ways. Experiment is key – The Fly LegsUp is a tool to get comfortable! 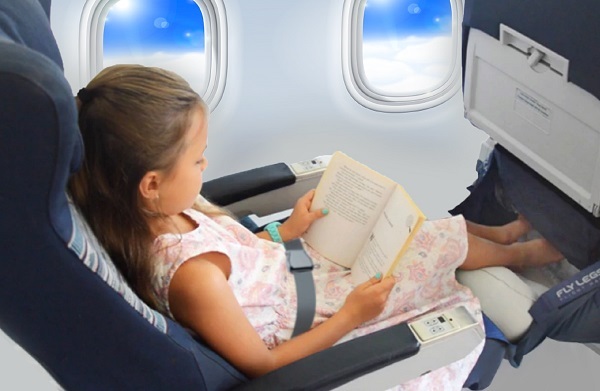 Fly LegsUp for Kids will support your child all the way whether they are a side sleeper, prefer their knees up, legs extended or whether they want to sleep or play. Note: The Flight Hammock is NOT to be used during taxi, take-off and landing. Children should be supervised by an adult at all times and continue to wear a seatbelt when using the Flight Hammock. 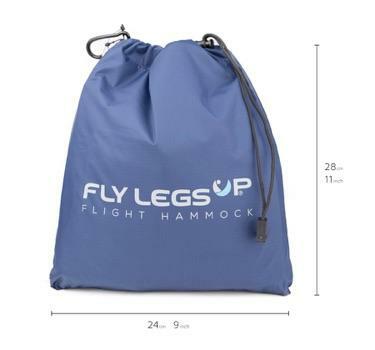 The Fly LegsUp Flight Hammock is safe, easy to use and adaptable. If you require more details on any of the topics below or have further questions, please do not hesitate to contact Fly LegsUp. They generally reply within 24 hours. 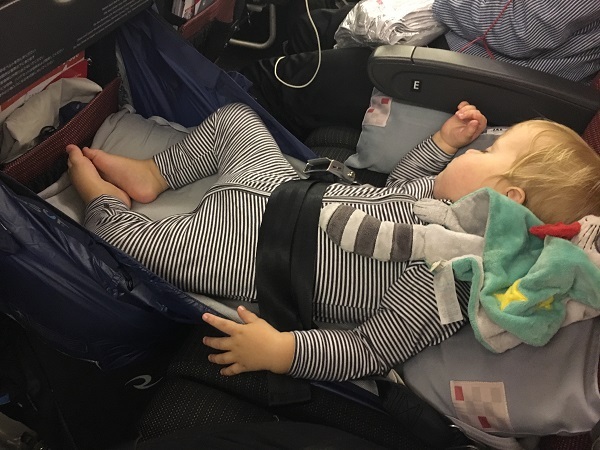 Most airlines and cabin crew are more than happy for you and/or your child to use the Flight Hammock and be comfortable. Use of Fly LegsUp is ultimately at the discretion of the cabin crew on the day and whilst we cannot guarantee you can use your hammock on every single flight, in our experience, it is unusual to be told you cannot use the hammock. Please refer here to see some of the international airlines our customers have flown with. – The Fly LegsUp has been comprehensively tested by a CASA authorised Aviation Engineer. The Aviation Engineering Report is downloadable here and concludes: “The Fly LegsUp flight hammock poses NO STRUCTURAL RISK to the seat structure, metal table assembly, metal tray table arms (with table stowed or deployed) or the seat occupied by the passenger. As a carry-on comfort aid, the hammock poses NO RISK to cabin flammability, egress or cabin safety if its permitted use is as per standard cabin practices and REMOVED from the seat for taxi, take-off and landing” – Jason Hazell (ARN 765973). – It was reviewed by The Civil Aviation Safety Authority (CASA) and they class it as a “carry on comfort aid” just like a neck pillow. A personal device designed to make economy more comfortable. 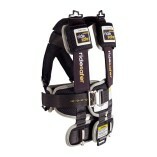 – It complies with FAA/GCAA/EASA/CASA safety regulations. – The hammock does not disturb the person in front or other passengers (some of our customers refer to this topic in their testimonials). – The hammock does not damage the tray table (as per Aviation Engineer Report). – Without the hammock, children tend to lie across parents laps and it can be impossible to continue to wear a seatbelt, but with the hammock they can easily wear a seatbelt. 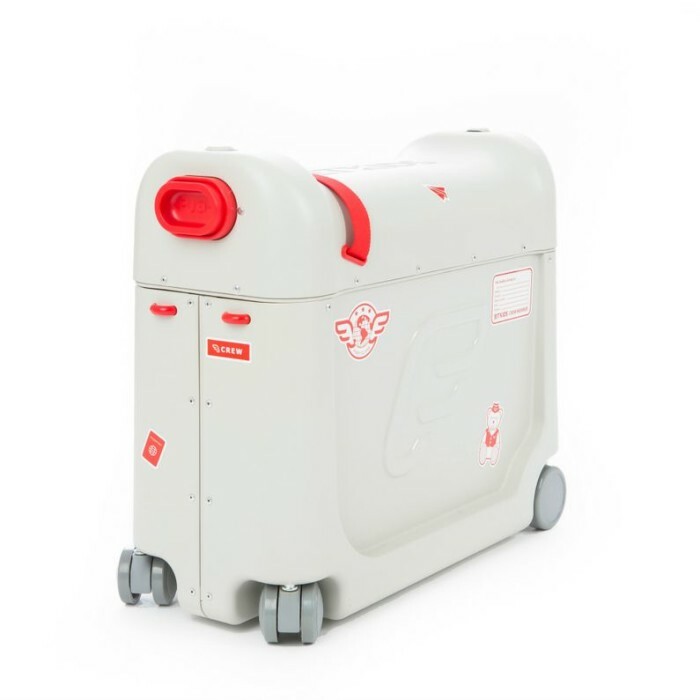 – It is only used during the cruise portion of the flight and will be stowed away for taxi, take-off and landing. If you were still asked to remove your Fly LegsUp by a cabin crew member, it would not be valid or correct that it was because of safety or egress according to our independent Aviation Engineering Report. If you have any questions, please Fly LegsUp. What if there is an emergency on the plane? If an emergency is declared, the hammock must not be used. The hammock can be removed in seconds and the pillows deflate quickly, due to the design of the valve. You can even sit on the Large pillow to make it deflate faster, while you are deflating the Small pillow. The soft fabric of the hammock allows you to tuck it into the magazine pouch. Alternatively you can stow the hammock and pillows under the seat in front of you. Who can use the Fly LegsUp? 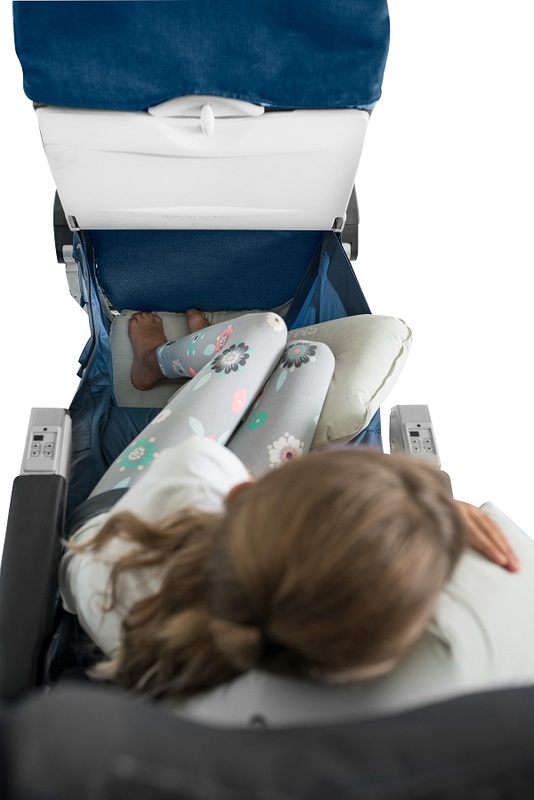 The Fly LegsUp for Kids is designed to help children sleep and play on long haul economy flights. We recommend the Kids pack for infants – approximately 9 years of age and older children or adults are better suited to the Adults pack. Children using their hammock should be supervised by an adult at all times and continue to wear a seatbelt during the flight. 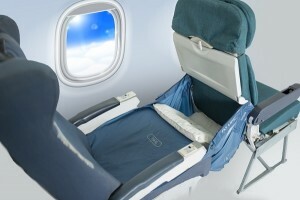 Fly LegsUp for Adults aims to optimise comfort and sleep whilst flying in economy. The Fly LegsUp may be beneficial for people who suffer from back pain, lower limb swelling and may also help reduce the risk of Deep Vein Thrombosis (DVTs), click here for more details on the potential health benefits of Fly LegsUp. To use the hammock you do require a certain level of flexibility to elevate your legs into the hammock. To see how the Flight Hammock has helped our customers, take a look at our customer testimonials. What is the difference between the Fly LegsUp for Kids and the Fly LegsUp for Adults? The hammocks are exactly the same and we sell the ONE Flight Hammock. As children grow, they can continue to use their hammock. The only difference between the packs is that the Kids pack comes with an additional pillow to create a flat platform/bed for children to sleep and play on. The platform level can be adapted by adding or removing pillows depending on the child’s age and the position that they want to be in. 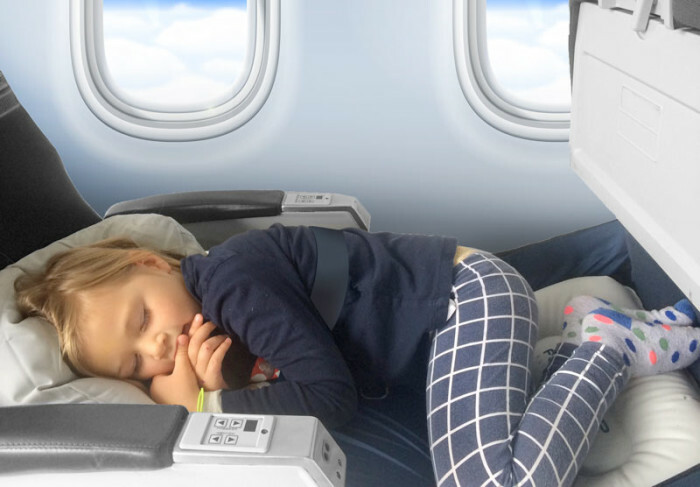 The Fly LegsUp for Adults pack includes one Large and one Small inflatable pillow and the Fly LegsUp for Kids pack includes two Large and one small inflatable pillow. Does it matter where I sit on the plane? 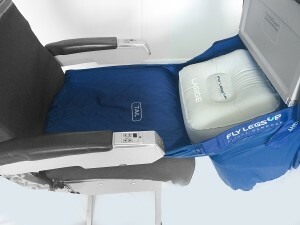 The Fly LegsUp Flight Hammock is designed for Economy. 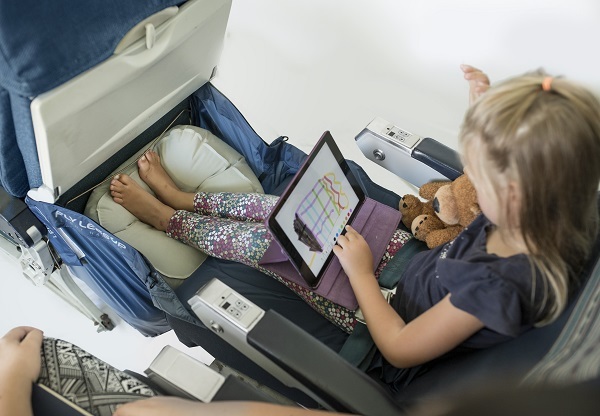 We recommend children sit by a window or the middle seat between the aisles, as depicted by Singapore Airlines here under ‘Convertible inflight beds for children’. 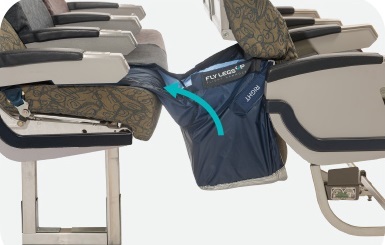 You will need a seat in front of you, as the Flight Hammock attaches to the arms of the drop down tray table. It cannot be used in bulkhead seats or areas without a seat in front of you. To make sure you have a seat in front of you, head to SeatGuru. Will it annoy the passenger in front? When we were developing the hammock it was very important that it not disturb or annoy other passengers. Due to the way airline seats are engineered and where the hammock attaches, movement in the hammock is not felt by the passenger sitting in front. This topic is mentioned by some customers in their testimonials. Will the hammock damage the tray table? The Fly LegsUp Flight Hammock has been comprehensively tested by a CASA accredited Aviation Engineer and will not damage the airline tray table. The tables are designed to be very strong. The Aviation Engineering report concludes: “The Fly LegsUp flight hammock poses NO STRUCTURAL RISK to the seat structure, metal table assembly, metal tray table arms (with table stowed or deployed) or the seat occupied by the passenger. As a carry on comfort aid, the hammock poses NO RISK to cabin flammability, egress or cabin safety if its permitted use is as per standard cabin practices and REMOVED from the seat for taxi, take-off and landing” – Jason Hazell (ARN 765973). Download the full aviation engineering report here. What happens when the seat in front reclines? Generally when the person in front reclines their seat, it means you will need to compensate by reclining yours. Airline seats around the world do vary, however we have not found there was any undue impact on using the hammock when the person in front reclines. See our video on What happens when the seat in front reclines? What if the person next to me wants to get past? If someone wants to get past your Fly LegsUp, take the Large pillow out leaving the Small one in the hammock, tuck the tail into the hammock and it will swing out of the way when someone passes. See our video on How to get past a Fly LegsUp. The hammock is slipping down the arms of the tray table. Some airlines have tray arms with a very steep angle and the straps will slide down. To compensate you can attach the straps to the horizontal bar that runs parallel behind the tray table as shown below. You may need to pull the tray towards you to expose the bar. Attach your hammock to the tray table as soon as you reach cruising height, as it is much easier to attach BEFORE the person in front reclines their seat. 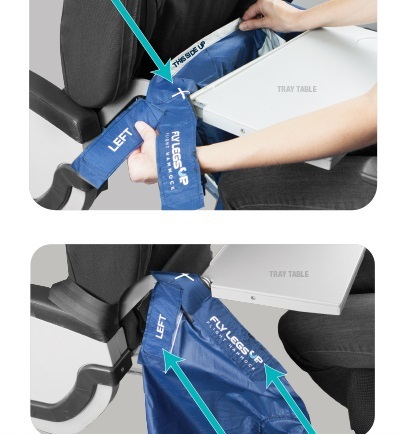 Alternatively you can attach it before takeoff and tuck it away into the magazine pouch for takeoff and then inflate the pillows when you want to use the hammock.